US$ 715 Price per person based on double occupancy, 3-star hotel & private service. All intermediate transfers included. Airfares not included. Andean city of La Paz, the highest capital in the world. Famous Witch Doctor’s Market, showcasing folk artifacts & remedies. Out-of-this-world rock erosion patterns of Moon Valley. Monumental Tiwanaku Ruins, a UNESCO World Heritage Site. Legendary Sun Island on Lake Titicaca, the birthplace of the Inca Empire. Colorful city of Copacabana on the shores of Lake Titicaca. You can add the Uyuni Salt Flats to this Bolivia Tour itinerary. See our 5 Day Uyuni Tour Package for more information. International flight Lima or Cusco – La Paz (booked on your own). Private transport WITH DRIVER ONLY from the airport to your hotel in La Paz. 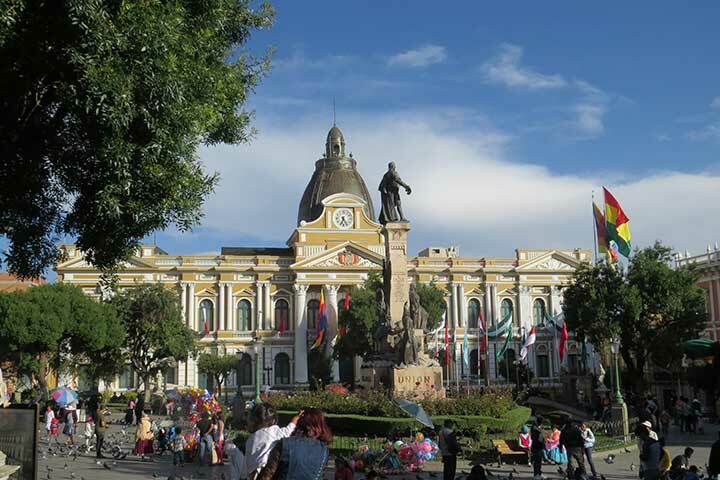 Meet at the lobby of your hotel to begin your Bolivia Tour with the highlights of La Paz. Start with the Witch Doctor’s Market (where you can find herbs, folk remedies and fascinating ingredients used in Aymara rituals), and the typical handicrafts market of Sagarnaga Street. Continue to the San Francisco Colonial Church (Museum not included) and Plaza Murillo where the Cathedral, the Government Palace, and the National Congress buildings are located. 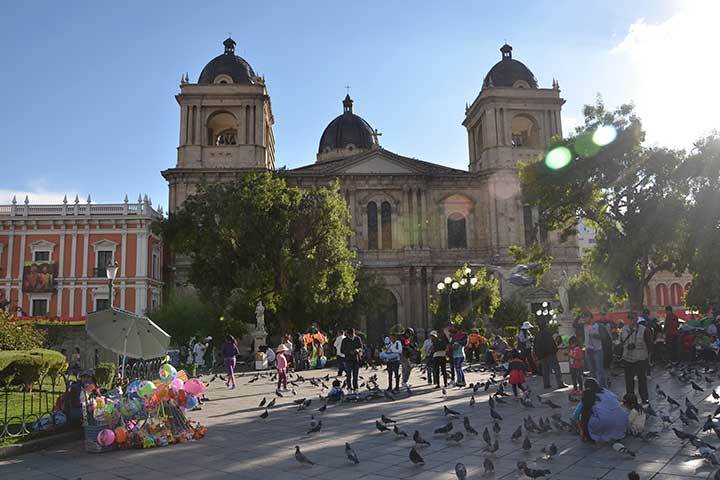 After this, visit the charming, cobble-stoned street of Jaen, one of the last colonial streets of downtown La Paz, and home to a range of museums, shops, bars and restaurants. Transfer to Plaza España to take the Yellow and Green Lines of the city’s sky lift towards the southern area of the city. Here you will enjoy panoramic views of the residential areas of Obrajes, Calacoto and La Florida. The tour ends with a fascinating visit to Moon Valley, an amazing display of rock erosion patterns like something from out of this world. In addition, you will visit and enjoy the small gallery of celebrated local potter, Mario Sarabia (duration: 4 hours). Return to your hotel. Overnight in Rosario Hotel La Paz. Pick up from the lobby of your hotel. Transport to Copacabana (duration: 4 – 4 ½ hours, altitude: 3,840m / 12,595ft). Lunch at the outdoor terrace of the Rosario Hotel, overlooking Lake Titicaca. After lunch, visit the Basilica, a stark, white, Moorish-looking building decorated with Portuguese-style blue tiles and rounded domes. Inside is the Shrine de la Virgen de Copacabana — a statue carved in the 15th century believed to be responsible for countless miracles. People believe that if she’s removed, Lake Titicaca will rise in rebellion and flood the town. We recommend you take an optional walk (duration: 1½hours) through the 12 Stations of the Cross, as devout Catholics do during the Easter season. This great walk uphill will help you understand the layout of the town and the position of nearby islands. The views of Lake Titicaca, on the way up, are also worth the journey. It is worth noting that in contrast to the strong Catholic influences found in Copacabana, you will also find Yatiris (Aymara masters) performing spiritual cleanings called “challas” or coca leaf readings. After your tour of Copacabana, transfer by boat to the Port of Pilkokaina in the southern part of Sun Island on Lake Titicaca–legendary birthplace of the Inca Empire. Here you will be welcomed by the La Estancia Eco-Lodge staff. Please note the lodge is situated at the top of the island and requires a smooth uphill walk with amazing views of the lake. 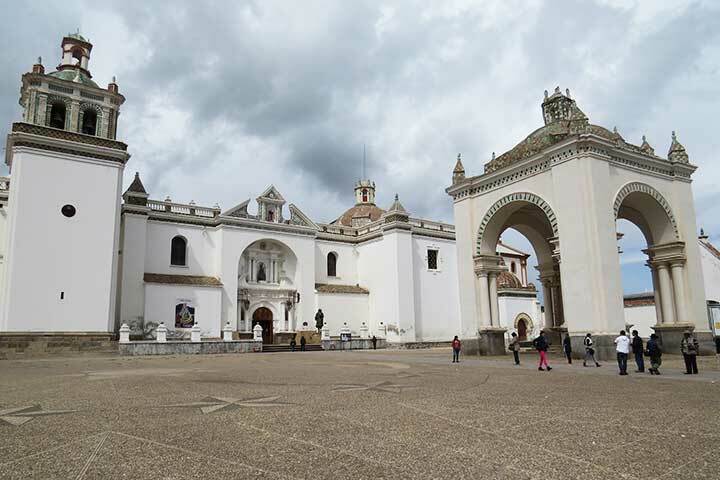 You will visit the Inca ruins of Pilkokaina Palace along the way, (duration: 1- 1 ½ hours). From the lodge, behold an amazing sunset. Evening free. Overnight at La Estancia Eco-Lodge. After enjoying breakfast at the Eco-lodge, walk down to the Port of Yumani and visit the Escalera del Inca, a stairway leading to the Inca Fountain, once believed to be a fountain of youth. This was a place where ceremonies dedicated to water and insemination of earth took place. After a short trek with wonderful panoramic views of Lake Titicaca, take a boat back to Copacabana (duration: 1 hour) to then be transferred to Tiwanaku (duration: 3 – 4 hours). After lunch, visit the Spiritual and Political Centre of the Tiwanaku Culture, which includes beautiful monumental stone buildings that survive in the protected archaeological zones. See the Kalasasaya Temple (Sun), the legendary Sun Gate, the Semi-subterranean temple (Earth), the Akapana Pyramid, the Puma Punku ceremonial center, as well as the museums where you will enjoy an impressive collection of objects and tools of ancient civilizations in addition to monumental monoliths (duration: 1 ½ – 2 hours). Transfer to your hotel in La Paz (duration: 1 ½ hours). Overnight at Rosario Hotel in La Paz. Meet at your hotel’s lobby to transport you WITH DRIVER ONLY to the airport. Take your international flight (booked on your own). The Mystical Bolivia Tour is customizable. If you prefer to travel for fewer days or add extra days or destinations to your trip, please let us know in the Notes section of the Get Free Quote form. You can also fill out our Design Your Trip form or Contact Us form with your specific requests. *This Bolivia Tour is in private service only. Prices include credit card payment fees. All guided excursions in English in private service. Visas required to enter Bolivia.